As we know Strings are widely used in Java programming, are a sequence of characters. In the Java programming language, strings are objects. The Java platform provides the java.lang.String class to create and manipulate strings. Java String literal is created by using double quotes. Each time you create a string literal, the JVM checks the string constant pool first. If the string already exists in the pool, a reference to the pooled instance is returned. If a string doesn't exist in the pool, a new string instance is created and placed in the pool. Now the question is why java uses a concept of a string literal? It's simple, to make Java more memory efficient (because no new objects are created if it exists already in string constant pool). Let's create a simple example to demonstrate by creating String objects using the new keyword. From the above example, JVM will create a new string object in normal(non-pool) heap memory and the literal "Java Guides" will be placed in the string constant pool. The variable str will refer to the object in heap(non-pool). Let's learn the String in depth by exploring all the String APIs with examples. String class implemented interfaces: Serializable, CharSequence, Comparable< String> . 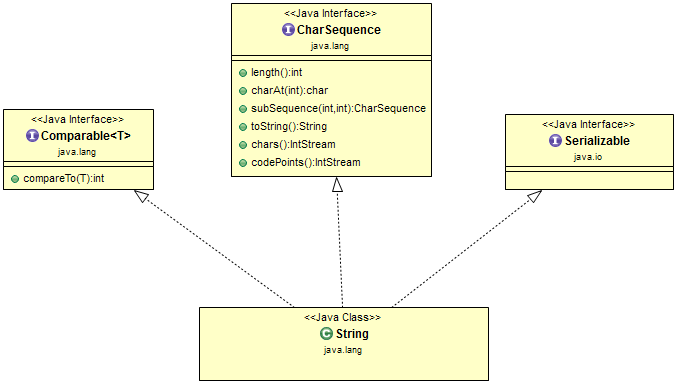 Refer more detail on java.lang.String JavaDoc. The String class supports several constructors. String() - Initializes a newly created String object so that it represents an empty character sequence. String(byte bytes) - Constructs a new String by decoding the specified array of bytes using the platform's default charset. String(byte bytes, Charset charset) - Constructs a new String by decoding the specified array of bytes using the specified charset. String(byte bytes, int offset, int length) - Constructs a new String by decoding the specified subarray of bytes using the platform's default charset. String(byte bytes, int offset, int length, Charset charset) - Constructs a new String by decoding the specified subarray of bytes using the specified charset. String(byte bytes, int offset, int length, String charsetName) - Constructs a new String by decoding the specified subarray of bytes using the specified charset. String(byte bytes, String charsetName) - Constructs a new String by decoding the specified array of bytes using the specified charset. String(char value) - Allocates a new String so that it represents the sequence of characters currently contained in the character array argument. String(char value, int offset, int count) - Allocates a new String that contains characters from a subarray of the character array argument. String(int codePoints, int offset, int count) - Allocates a new String that contains characters from a subarray of the Unicode code point array argument. String(String original) - Initializes a newly created String object so that it represents the same sequence of characters as the argument; in other words, the newly created string is a copy of the argument string. String(StringBuffer buffer) - Allocates a new string that contains the sequence of characters currently contained in the string buffer argument. String(StringBuilder builder) - Allocates a new string that contains the sequence of characters currently contained in the string builder argument. Let's learn few important String offered Constructors with examples. will create an instance of String with no characters in it. This constructor initializes s with the string "abc". This initializes s with the characters cde. // Construct one String from another. As you can see, s1 and s2 contain the same string. // Construct string from subset of char array. To extract a single character from a String, you can refer directly to an individual character via the charAt() method. Example 1: Returns the char value at the specified index of this string. The first char value is at index 0. Example 2: Throws IndexOutOfBoundsException - if the index argument is negative or not less than the length of this string. This method returns the character (Unicode code point) at the specified index. The index refers to char values (Unicode code units) and ranges from 0 to length()- 1. This method throws the IndexOutOfBoundsException - if the index argument is negative or not less than the length of this string. This method returns the character (Unicode code point) before the specified index. The index refers to char values (Unicode code units) and ranges from 1 to length. This method returns the number of Unicode code points in the specified text range of this String. The text range begins at the specified beginIndex and extends to the char at index endIndex - 1. This method throws IndexOutOfBoundsException - if the beginIndex is negative, or endIndex is larger than the length of this String, or beginIndex is larger than endIndex. Often, it is not enough to simply know whether two strings are identical. For sorting applications, you need to know which is less than, equal to, or greater than the next. A string is less than another if it comes before the other in dictionary order. As you can see from the output of this example, compareTo() takes into account uppercase and lowercase letters. The word "Now" came out before all the others because it begins with an uppercase letter, which means it has a lower value in the ASCII character set. // -2 because "H" is 2 times lower than "J"
// 1 because "G" is 1 times greater than "H"
Example 3: Compare string with black or empty string using compareTo() method. Note that compare with an empty string returns length of the string. This method creates a new object that contains the invoking string with the contents of str appended to the end. concat() performs the same function as +. contentEquals(CharSequence cs) - Compares this string to the specified CharSequence. contentEquals(StringBuffer sb) - Compares this string to the specified StringBuffer. Here, str is the String object is compared with the invoking String object. It returns true if the strings contain the same characters in the same order, and false otherwise. The comparison is case-sensitive. Here, str is the String object is compared with the invoking String object. It, too, returns true if the strings contain the same characters in the same order, and false otherwise. There are four versions of getBytes() methods. There is an alternative to getChars() that stores the characters in an array of bytes. byte getBytes() - Encodes this String into a sequence of bytes using the platform's default charset, storing the result into a new byte array. byte getBytes(Charset charset) - Encodes this String into a sequence of bytes using the given charset, storing the result into a new byte array. void getBytes(int srcBegin, int srcEnd, byte dst, int dstBegin) - Deprecated. byte getBytes(String charsetName) - Encodes this String into a sequence of bytes using the named charset, storing the result into a new byte array. Let's write an example to demonstrate all the getBytes() methods. // default charset, storing the result into a new byte array. // storing the result into a new byte array. Here, sourceStart specifies the index of the beginning of the substring, and sourceEnd specifies an index that is one past the end of the desired substring. Thus, the substring contains the characters from sourceStart through sourceEnd–1. The array that will receive the characters is specified by target. The index within the target at which the substring will be copied is passed in targetStart. Care must be taken to assure that the target array is large enough to hold the number of characters in the specified substring. The main usage of lastIndexOf() - Searches for the last occurrence of a character or substring. Example: This program demonstrates the usage of all 4 lastIndexOf() methods. Example: Example to print the length of string "Java Guides". puts the string "Hewwo" into s.
Example: This is a complete example to demonstrate the usage of replace() methods. Example: This is a complete example to demonstrate the usage of replaceAll() methods. Example: This is a complete example to demonstrate the usage of replaceFirst() methods. There are two form of split() methods. split(String regex) Splits this string around matches of the given regular expression. split(String regex, int limit) - Splits this string around matches of the given regular expression. Example: This is a complete example to demonstrate the usage of split() methods. The startsWith() method determines whether a given String begins with a specified string. Example: This is a complete example to demonstrate the usage of startsWith() methods. Example: This is a complete example to demonstrate the usage of subSequence() method. There are two forms of substring() methods. String substring(int beginIndex) - Returns a string that is a substring of this string. String substring(int beginIndex, int endIndex) - Returns a string that is a substring of this string. These methods throw IndexOutOfBoundsException- if beginIndex is negative or larger than the length of this String object. Example: This is a complete example to demonstrate the usage of both substring() methods. Example: This is a complete example to demonstrate the usage of toCharArray() method. There are two forms of toLowerCase() methods. toLowerCase() - Converts all of the characters in this String to lower case using the rules of the default locale. String toLowerCase(Locale locale) - Converts all of the characters in this String to lower case using the rules of the given Locale. Example: This is a complete example to demonstrate the usage of both toLowerCase() methods. There are two forms of toUpperCase() methods. toUpperCase() - Converts all of the characters in this String to upper case using the rules of the default locale. String toUpperCase(Locale locale) - Converts all of the characters in this String to upper case using the rules of the given Locale. Example: This is a complete example to demonstrate the usage of both toUpperCase() methods. Example: This is a complete example to demonstrate the usage of trim() method. The valueOf() method converts data from its internal format into a human-readable form. The Java string valueOf () method converts different types of values into a string. By the help of string valueOf () method, you can convert int to string, long to string, boolean to string, character to string, float to a string, double to a string, object to string and char array to string. Example: Let's see an example where we are converting all primitives and objects into strings. Please comment if any suggestions to improve this String API Guide as it is very useful to everyone.